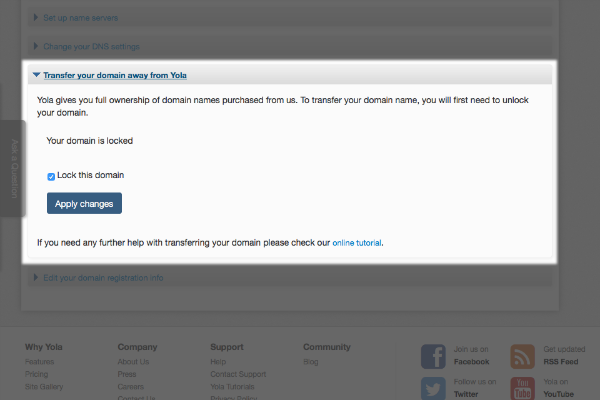 Transfer a domain purchased from another service to Yola. Set up an email account for your domain by accessing the Advanced Domain Settings. We have a tutorial to help you setup your email addresses using Yola Mail, Google Apps or Windows Live: Creating email addresses. 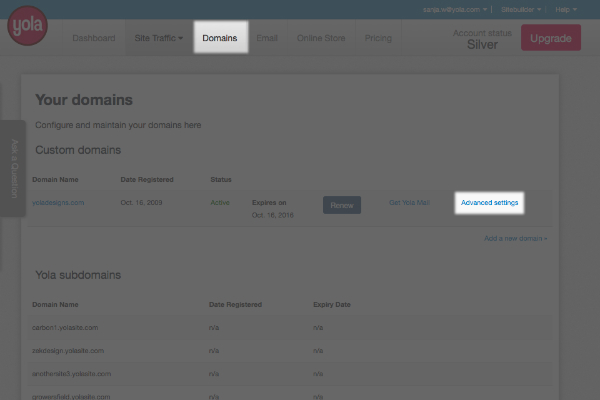 If you have several different Yola sites, you can move your paid domain name from one site to another. If you have several domains that all point to one site, you can choose which one is the primary URL, which will appear in the web browser. This tutorial will help you locate your domain's settings, and understand how to change the domain settings on the domain you bought from Yola. If you would like to know how to buy your domain, you can click on this link for the tutorial: Buying your domain from Yola. If you have purchased a domain from Yola or transferred your domain to Yola, you will be able to renew your domain by clicking Renew next to the domain you would like to renew. When you purchase a domain, you will be opted in for automatic renewal, which you are able to opt-out of at any time. You have complete control over your auto-renewal status, and can manage it in My Yola, in the respective "Domains" or "Account" pages. For more information, please see Renew the domain you purchased from Yola. If you have a domain that you've purchased through another service and would like to transfer it to Yola, then you can click on one of the options under "Add a domain you already own". 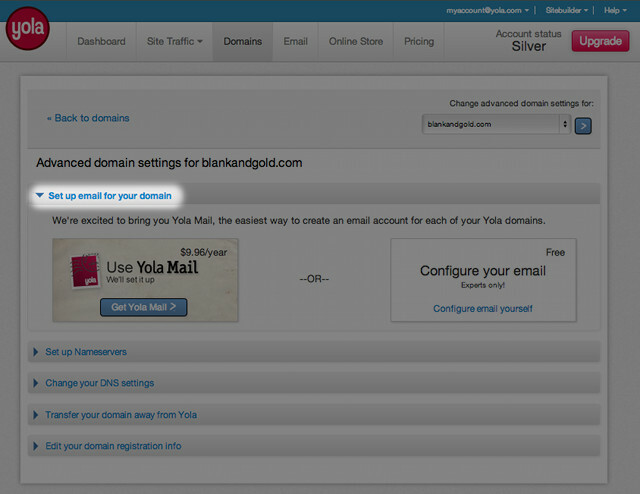 For a step-by-step tutorial, please see Transferring your domain to Yola. Log in to My Yola and click Domains along the top menu bar. To setup your email address, please click on this link: Creating email addresses with your domain purchased from Yola. If you would like to change the name servers on your domain's settings, click Set up name servers and then click Change name servers for .... Please note that changing the name servers will prevent your published Yola site from being accessed. Make the change and click Update name servers. If you need to add more than two entries, click Additional name servers. To access and edit the A Record, MX Record and CNAME, click Change your DNS settings. 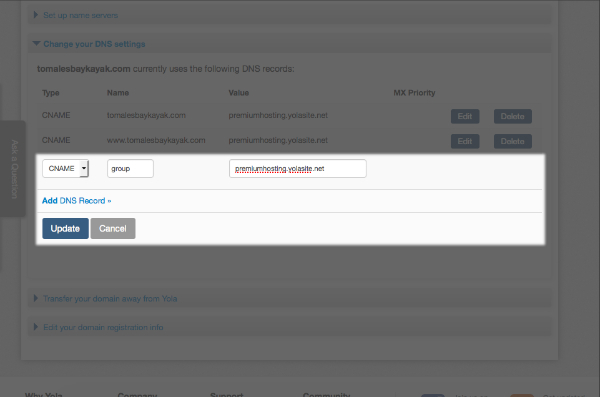 To add new DNS Records, click Add DNS Record. Please note: If you would like to add an SPF or DKIM TXT record to your domain's DNS to please email support@yola.com and we will do it for you. To add an A record, make sure that A is selected after clicking Add DNS Record. This defines how your domain's email should be routed. For a tutorial on setting up your email with Google Apps (Gmail), click here: Creating email addresses. To add an MX Records, make sure that MX is selected after clicking Add DNS Record. To add a CNAME, make sure that CNAME is selected next to "Add DNS Record". To make sure your domain is locked or to transfer your domain to a new registrar, click Transfer your domain away from Yola. Locking your domain name prevents unauthorized transfers of your domain to another registrar or web host. It will also help you avoid unauthorized third parties who might try to misdirect your name servers or transfer your domain without your permission. Your domain is locked by default. To ensure that your domain is locked, the box next to "Lock this domain" should be checked. If you would like to transfer your domain to another domain registrar, uncheck this button and an email will be sent to you. The email will contain the transfer code you will need to give to your new domain registrar in order to complete the transfer. I want to change to another domain registrar. Please see the steps above on "Transferring your domain away from Yola". Remember, you can keep Yola as your domain registrar and change your DNS settings to use another service. It's often a lot quicker than transferring your domain. I bought a domain but now I want to enable domain privacy, how do I do that? Good news! If you purchase a domain along with one of our annual hosting packages (Yola Bronze, Yola Silver or Yola Gold), you get one year of free domain privacy along with some other fantastic features! If you opt for a monthly hosting plan, domain privacy is available as an add-on for $9.95 USD. Please note: You cannot publish your Yola site to your domain unless you buy a hosting package.